Have you ever experienced that when you try to add new Domain Service, the Domain Service Class Wizard Doesn't Find Entities? 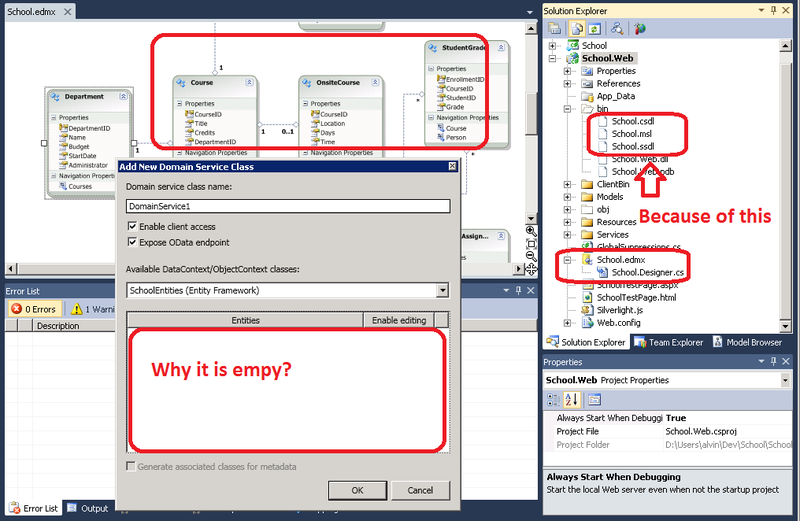 Even if you have selected a existing Entity Data Model? See the below screen. Here are some of the scenarios that lead to above situation appears. Solution: Before adding Domain Service, build your project after yous Entity Data Model is created. If you have created your those file manually, Domain Service Class Wizard does not know where to find those files. 3. You have generated Entity Data Model by Entity Data Model, but you set Meta Artifact Processing of you model to "Copy To Output Directory" instead of default "Embed in Output Assembly". Solution: Set Meta Artifact Processing back to default "Embed in Output Assembly". It seems that Domain Service Class Wizard only look into output assembly(BUG?). In this case, you can see CSDL, SSDL, MSL files under your bin folder. 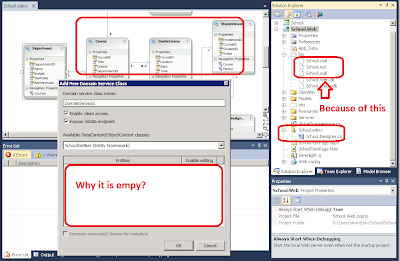 This also cause Domain Service Class Wizard can not find the entities. 4. Visual Studio is screwed up, is working properly.